Before the antennas can be deployed, the entire site needs to be levelled first. This includes not just the array area, but also the nearby access points and the region which we have set aside for storage of the HBA tiles that will be delivered soon. In order to get the level just right, a laser levelling system is used. A rotating mirror and laser project a beam that is perfectly level across the entire site. A staff (with audible feedback unit) is moved to different locations so the contractors can work out how much material needs to be shifted by the 18-tonne digger. The staff with optical detector (the blue gadget with black connector) can be seen in the photograph, alongside the larger blue unit, which contains the rotating laser. The digger is in the background. 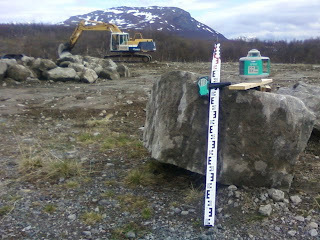 The stone that the equipment is resting on is just one of the boulders that has been dug out of the site so far. There's actually a lot of material like this, but the digger can get it out without too much trouble.